Did you know that May is National Preservation Month? The National Trust for Historic Preservation has declared this year's theme as "celebrating America's treasures" to bring awareness to the preservation of "irreplaceable and tangible reminders of our roots." To honor this important month, Old House Web salutes the historic home as a significant place that has contributed to the American experience. Visit select homes and other historic landmarks by reading through our various tours, videos, and images. 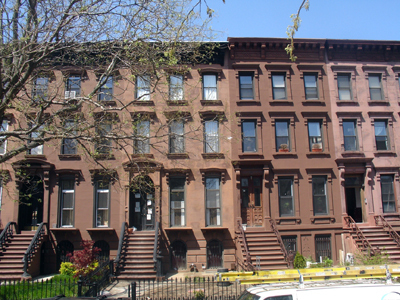 Four brownstones on MacDonough Street in Brooklyn were nearly destroyed in 2010 when a load-bearing cellar wall crumbled. Through quick, emergency intervention they were saved. A year later, construction continues. A room-by-room visual tour of the house restored to its 1860 appearance. Founded in 1565, this city has been inhabited ever since. A tour of its houses offers a window to our past.